The beauty of the Spring sky. The April sky begins to give space to the summer celestial bodies. Vega, Altair and Deneb peep out to announce the arrival of summer and the sky becomes less clear. The Lyrids are preparing to punctuate the vault heavenly with the spectacle of falling stars. Here are the main astronomical events of April 2019. Spring is synonymous with change, renewal, “preparation” for the warm season… This is also true in the field of astronomy. Among the astronomical events of April we can already see some of the celestial protagonists of the summer. Vega, Altair and Deneb, but also Jupiter and Saturn are announcing the summer season. 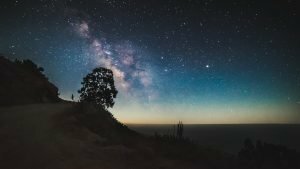 In occasion of the imminent arrival of summer, Jupiter and Saturn are in fact preparing to “dance” in the starry sky displacing Mars, Mercury and Venus which are less brilliant. In the night between 22 and 23 April, among other astronomical events, it will be possible to admire a conjunction between Jupiter and the Moon, looking towards the constellation of Ofiuco. With the arrival of the beautiful season the two “Lords” of the Solar System , Jupiter and Saturn will be in opposition, that is, at 180 ° with respect to the Earth. A phenomenon that will allow us to observe them at their best during the summer nights. What about the winter constellations: Orion and the Taurus, are about to leave space for the spring and summer constellations of the Lyra, the Cygnus, the Aquila. With their main stars, Vega, Deneb and Altair will accompany us during the hot and long summer nights forming the Summer Triangle. Characteristic of the spring and summer sky will be the fact of being less clear than the winter one. Another astronomical event that will take place on April 13, will be the occultation of the M44 cluster by the Moon. This event will be visible with a telescope or binoculars as darkening of some stars of the M44 cluster by the Moon. Our satellite in that day will be in phase of 61%. M44 is the Presepe cluster, also known as the Hive Cluster or NGC 2632 visible in the constellation of Cancer. Contains red and white dwarf giants, stars at the last stage of evolution. It is also visible to the naked eye and is very easy to spot. It is located between Regolo (constellation of the Lion) and Pollux (constellation of Gemini). The occultations by the Moon of M44 are very frequent. This phenomena allows astronomers to study the double stars present in the cluster. Among the astronomical events of the April sky there is the meteor shower of the Lyrids. It seems to come from the constellation of Lyra. It’s a parallelogram of stars among which Vega stands out, the fifth brightest of the night sky. The swarm of the Lirids will probably be barely visible. This is both due to the poor visibility of the meteors and due to the often unfavorable weather conditions. The Lyrids are concentrated between 15 and 25 April, with a peak in the night between 22 and 23 April. It will be possible to observe from 5 to 20 meteors per hour, if conditions allow. 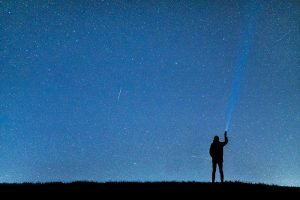 Consider that the swarm of the Perseids in August allows to observe about 100 every hour … As for the observation, the night between 22nd and 23rd April there will be the full Moon. we can say that the vision of the Lyrids is quite ” unfortunate “. So (hopefully) it will not be for the other astronomical events that we can still admire in the spring sky.